Aqua World is the water-themed and third world of DK: King of Swing. It is accessible after Wild West World is completed, and is followed by Ice World. 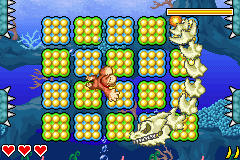 Aqua World's boss is Davy Bones, who can be fought after Donkey Kong or Diddy Kong complete every level. The Aqua World has a variety of landmarks, a fraction of which are water-themed. The first level and the boss fight take place underwater, while the second level is set by a waterfall with Lockjaws that jump out at anyone. The northeastern part of Aqua World has a derelict, haunted galleon. The Kremlings also have a base on a small island. 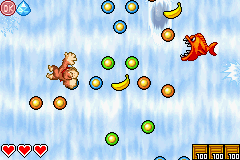 A few objects first appear in this world, such as falling Pegs, Spinning Pegs, cannons that fire out pegs, and pegs that only appear when the Kong holds onto another one around them. Aqua World features both land and underwater enemies. 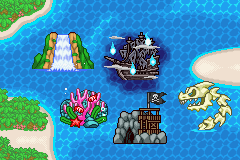 The land enemies include Kritters, Flipflaps, Powans, and Zingers, while the ones featured underwater are Shuris and Lockjaws. 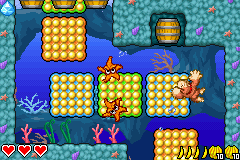 Aqua World has four regular levels, and each one has their own Medal. The first two levels have a bronze one, the next two have a silver one, and the boss battle has a gold Medal, just like the other worlds. A Crystal Coconut is hidden in every level except for the boss fight. Risky Reef This level takes place in a coral reef. Lockjaw and Shuri enemies are encountered here for the first time. Donkey Kong will be affected by the weight of moving underwater as he has to climb his away out of the reef. He must also break the Question Barrels to progress in the stage. These barrels, when destroyed, will make pegs appear for DK to climb. Lockjaw Falls This level has Donkey Kong climbing up a waterfall as Lockjaw jump out of it. Some of the pegs used to climb the waterfall are being dragged downward by the waterfall itself in a part of the stage. Kremling Kamp The Kremling Kamp is a small establishment put together by Kremlings that DK must overcome. He will find multiple Kritter in the area, as well as the Question Barrels seen previously in Risky Reef. 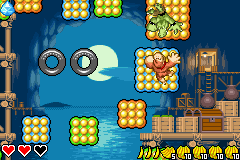 This level has plenty of Tires that can bounce Donkey Kong away and off course. Ship of Souls Ship of Souls takes place in the interior of a sunken, haunted ship. Donkey Kong will have to climb on pegs being launched out of a cannon, defeat ghosts, and utilize a unique type of peg that makes other pegs around it appear in order to complete the stage. 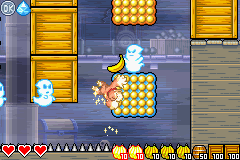 Davy Bones' Locker In this boss level, Donkey Kong will face off with Davy Bones in his water lair. Davy Bones will try to lunge at DK, and after he dodges, he can grab its tail and slam it into some spikes to damage it. Bones will do the same attack pattern throughout the fight. This page was last edited on April 3, 2019, at 00:38.